This morning I had a blast from the past via Facebook … social media is incredible that way! When I was in High School (years and years ago) I had my first great love … “the One”. I was obsessively in love with this person. So imagine my surprise, after all these years to hear from the person you loved so deeply. It wasn’t anything exceptional … just, “Hey, it sure has been a long time!” What was interesting was what this stirred up in my meditations today. Back then, I literally had nothing good in my life … within the scope of a few years everything good had systematically been taken out of my life … my mother, my father, my family, my innocence. It basically was a period of my life … that just flat out sucked. So when this person came along … well, they were my only light, the only thing that made me feel worth anything. I wrote their name hundreds of times on book covers … you know, all the pathetic stereotypes of a teenager in love. I literally made that person my life … and I would have gone to ANY length (literally) to make things work between us. In meditating on my prior post (“What I do unto the least“), Jung talks about the lengths we go to to show love to others … yet we deny that same love to ourselves. So I thought of how deeply, and obsessively I loved that person way back when. I looked into my life currently and saw some of the very same themes … some of the same ways I love people today. In doing so, I realized that long ago I learned to place my own self worth in whether somebody else loved me. From that I learned how to please people. I morphed into an outgoing people-pleaser in college and in my twenties (and beyond) … I became somebody that everyone liked (seemingly) and enjoyed being around. All of this was based in what I taught myself in High School … that the only way I was worth anything was if I was loved by others. The more I was loved by people around me, the more wonderful I felt … and the more I was rejected the worse off I would be for it. Well, when you are a performer … there’s QUITE a lot of rejection that goes with that career path! The more rejection I would feel, the more I would throw myself into being loved … that would counterbalance things enough so that my own self-worth was manageable. The problem is, you can’t really make people love you … what you end up learning are all the tricks of this twisted game to generate self-worth. In truth, what you are giving is not Love in and of itself … it is selfish love. It is a commodity to be traded. 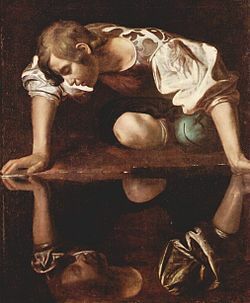 As I continued to meditate, the image of Narcissus came into my mind … the ancient figure so vilified for his Self-Love … how selfish he is always portrayed as having been. Even the word today, narcissistic, comes from this story. Well, truthfully, it seems to me that we all could do with a little … no, a LOT … more Self-Love. Maybe not the specific kind of “love” that Narcissus heaped upon himself … but God’s Love … definitely! There certainly are different kinds of Self-Love … hence the dilemma: do we obsess about ourselves at the expense of others? No! Do we accept the beauty that is God’s Love for us as our own self image?? YES!! I came to the conclusion, toward the end of my meditation, that I am going to spend the rest of this month dedicated to the task of Loving myself. What I mean by this is as follows: every time I begin to engage in that game that we call “love” … that activity that really is more about making ourselves feel good or worthy … I am going to stop, go inward and spend that energy and time Loving my Inner Self. Every time I am about to send an e-mail with the intent of getting self-affirmation in return. Every time I give a gift, or guesture, and the motivation is to get other people to love ME … instead of being a genuine act of Love … I am going to stop, and meditatively pour God’s Love inside myself. I am going to plug that obsessive love that I had for my first love … into myself … and allow that to change into God’s Love for me … to bring healing into that place. Like my post yesterday on the Phoenix leaving its ashes behind … I am going to rise above the false-love I have learned and focus on God’s LOVE … receive God’s Love for me … and allow that to continue the transformation I have been going through. I can’t ever truly Love others, until I can give God’s LOVE to myself … until God’s LOVE truly liberates me and turns those old chains … to the ashes I will rise from. It is a retracing of the Narcissus myth, with an important twist. If you wish, I’ll email you the file. It will make you think, if not more.